There are many ways that people can injure their teeth. There are also many types of tooth injuries. Teeth are made of bonelike material that can be injured. Treatment depends on the type of injury a person has. A dentist will know the right way to treat a tooth injury. Avulsion of Tooth (knocked out tooth): this is a dental emergency. A knocked out tooth needs to be quickly put back in its socket. This should be done within minutes. Do not wait more than 2 hours. Concussion of Tooth: this is when a tooth was bumped but is not loose. This is the most common dental injury. No dental care is needed right away. Rarely, a concussed tooth can die. This will happen after a few days or weeks. A tooth has died when it becomes darker than the other teeth. Crown Fracture Complication: this can be a cracked tooth with pulp exposure. There is most often a large piece of the tooth that is broken off. There also may be a small red dot or pink blush in the fractured area. This is the pulp. It is quite painful and is very sensitive to air and cold liquids. To help pain and prevent tooth damage, these fractures need to be treated right away. Most of these fractures will need a root canal. Chipped Tooth (no pulp exposure): this is a small painless chipped tooth. This should be looked at by a dentist in 24-72 hours. Cracked Tooth (infraction): this is a small hairline crack of a tooth. There is a thin fracture line without any missing piece of tooth. This should be looked at by a dentist in 24-72 hours. Intruded Tooth: the tooth has been pushed deeper into the gum and tooth socket. This should be looked at by a dentist in 24-72 hours. Loosened Tooth: this is also called subluxation. If there is only mild looseness, the tooth most often tightens up by itself. The gums may bleed a little. Loosened and Displaced Tooth (luxation): see a dentist. Displaced teeth that get in the way of biting, chewing or closing the mouth need to be moved back. This should be done within 4 hours. Mild displacement should be looked at by a dentist within 24 hours. You can treat minor tooth injuries at home. Cold: For pain or swelling, put a piece of ice on the injured gum area. You can also use a popsicle. Do this for 20 minutes. Soft Diet: If you have any loose teeth, eat soft foods for 3 days. After 3 days, the tooth should be less loose. To save the tooth, it must be put back in the socket (reimplanted) as soon as possible. Two hours is the outer limit for survival. Right away is best. Step 1: Rinse off the tooth with saliva or water. Do not scrub the tooth. Step 2: Replace it in the socket facing the correct way. Press down on the tooth with your thumb until the crown is level with the adjacent tooth. 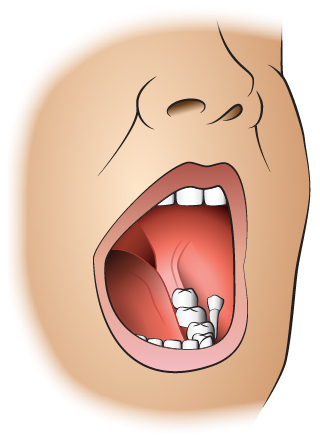 Step 3: Lastly, bite down on a wad of cloth to stabilize the tooth until the injured person can be seen by a dentist. If your dentist is not immediately available, then go to the emergency department. If the tooth cannot be put back in its socket: Place the tooth in either milk or saliva to keep it from drying out, and go right away to the dentist. Again, If your dentist is not immediately available, then go to the emergency department. Even if you get the tooth back in the socket right away, only time will tell whether the tooth will live. It may not. It is very important to keep the knocked out (avulsed) tooth moist. Do not let it dry out. Transport the tooth in milk or saliva. 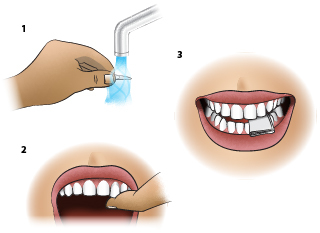 These images show how to transport the tooth in milk. 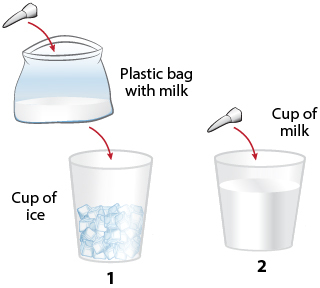 Milk Transport - Method 1 (best): Place tooth in a small plastic bag with some milk. Put plastic bag in a cup of ice. Milk Transport - Method 2: Place tooth in a cup of cool milk. It is very important to keep the tooth moist. Do not let it dry out. Transport the tooth in milk or saliva. These images show how to transport the tooth in saliva. Saliva Transport Method 2: Put the tooth in a cup and keep tooth moist with saliva (spit).